I'm trying to finish the beginner Admin trailhead module but I can't download an app from the app exchange into my Trailhead Playground instead it attempt to download into my PRD ORG. I sign into Trailhead with my PRD creditals. Does anyone know what I am doing wrong here? Please help! When you try downloading the app from APp exchange, it asks for the login credentials. 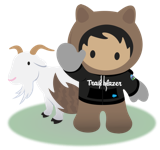 Try giving a Developer ORg credentials, where the Developer Org is connected to Trailhead. Else, you can have option to loginto Trailhead Playground, when you try completing the challenge. You can loginto One of the Playground. In the user record. Reset the password, so that you can use those credentials to login to app exchnage. From the CPQ Quote "Edit Lines" button I get a screen which tells me the quote has no line items and to click the "Add Products" button, however there is no add products button. This is in a sandbox org, which was just refreshed from production. I've done the OAuth already in the config settings. What else am I missing? is there a way to limit target amount adjustment to apply only certain products on a quote. We are in the middle of the CPQ implementation, Currently, we have in-house built Target Amount functionality built on standard quote object which sales team loves it and we would like to replicate the functionality on CPQ Quote object. The issue with CPQ Target Amount functionally is, it will adjustment all the lines items on the quote by default and we need to limit that and should only adjust the software line items and it should not be applied on PS or training line items. is there a way to accomplish this. If the reason it should not adjust PS/training is because those items are non-discountable by sales reps at all, then yes, you can set "non-discountable" to true on the product record, which in turn will set it to true for any new quote lines, and Target Amount will only modify the quote lines where that field is set to false. If the answer is some other reason, unfortunately you will not be able to use the out-of-the-box field, but you would be able to create your own custom field on the CPQ Quote object and use a price rule to set a discount or modify a price in a number of ways which can be governed according to the logic you need. E.g., the entry criteria for the price rule could be "product family = software" for starters.